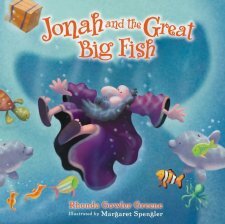 Jonah and the Great Big Fish by Rhonda Gowler Greene is a sweet children’s book retelling the story of Jonah from the Bible. Author Rhonda Greene uses rhyming to tell the Bible story in a fun and interesting way. The excitement and pace of the story are sure to keep young readers entertained while learning this favorite childhood story. In this story, Greene explains how Jonah ran from God and fled by boat. A huge storm and a frightened crew toss Jonah overboard where a big fish swallows him! As the story goes, after three long days, the fish delivers him to the shore. The true test for me is the reaction of my two boys, ages 5 and 7. My younger son was anxious to get his hands on the book when it arrived. He was drawn in by the beautiful illustrations. The pictures are colorful, vibrant, and clear. The characters are friendly, and not scary…including the fish. My five-year old laid in the kitchen floor for at least thirty minutes looking at each picture. He enjoyed the story and asked many questions. My older son did not show the same interest. He listened intently as I read, but did not show interest beyond the initial reading. I feel the book is more appropriate for ages 3-6. The back of the book states ages 4-8. I really enjoyed this title and I would definitely pursue other children’s books by this author. I was given a complimentary copy of this book by its publisher and BookLookBloggers in exchange for an honest review.